Gram-positive bacteria signify a surface organelle that decorates the cell surfaces using Sortase enzymes. The mechanism of SrtC links to the formation of amide or peptide bonds between cell surface proteins that sorting signal to strategically positioned amino groups. Sorting signals linked to peptidoglycan function as the principal architects of the cell wall and facilitate each microbe to effectively interact with its host environment. 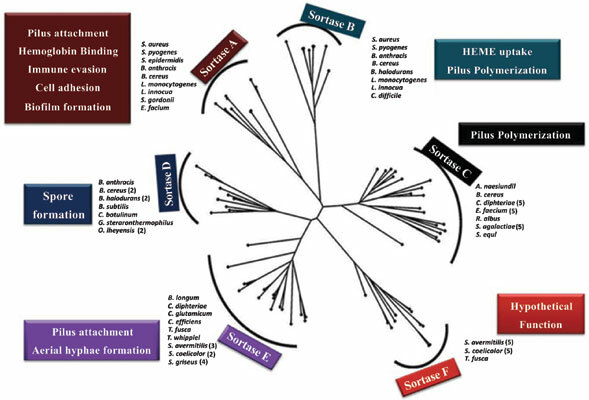 These enzymes play a fundamental role in microbial physiology and interestingly, sequence analysis on Gram-positive bacteria implies that approximately 60% of sortases are categorized into six families, and from that SrtA and SrtC are widely investigated in various literature. Sortase felicitates several functions that include adhesins, internalin’s, blood clotting, immune evasion factors and transporters for nutrients across the microbial cell wall envelope. Recent evidence has proved that removal of Sortase genes tends to loss of host cell adhesion mechanism and inhibition of Biofilms. So that, blocking the Sortase enzyme is a powerful target and due to the receptor availability in all Gram-positive types, it is so called as a universal drug target for gram-positive pathogens. Sortase enzymes have been intensely studied for anti-infective studies and this review focus the mechanisms of surface protein anchoring to the cell wall envelope by sortases and highlight how it plays a strong role as a drug target. SrtA, Biofilm, Gram positive, Bacterial pathogens, Sortase, Drug target, Surface proteins.